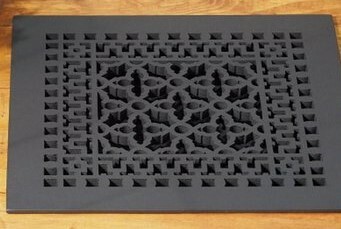 Register and grille vent covers add beauty and charm to any room in your home and are necessary components for your HVAC unit. Whether replacing a vintage register, or new construction, a pretty and fully functional register will keep your home warm and cool in style. Registers are a means of regulating air flow from the HVAC unit. This is controlled with a louvered damper that directs the amount of air flow. Dampers can be closed in unused rooms that do not need to be heated or cooled. Registers can be located in the wall, floor or ceiling depending on the placement and style of HVAC unit. Van Dyke’s carries over 25 styles of registers from Victorian to Classic to Modern. Grilles are the vents through which air is pulled out of a room for circulation back to the central heating or cooling unit. Return air grilles can also be located in the floor, wall, or ceiling. Make sure nothing is placed in front of the grille to obstruct air flow. Changing the filters monthly will help remove dust and contaminants from the air and prevent clogging of the HVAC system. Unsightly metal return air grilles collect dust and are an eyesore. Replace stamped-metal grilles with beautiful, wood louvered grilles made from Poplar Wood. What a difference in appearance to the room is created as seen in the photo to the left. 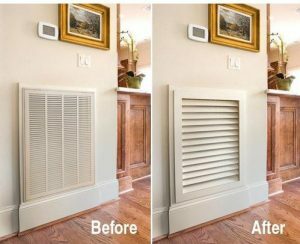 The Worth Home Premiere Luxury Return Air Grille from Van Dyke’s Restorers comes with an easy to install metal sleeve that holds a 1-inch filter and ensures a flush wall mount. The patented design securely locks the grill into the wall without visible screws or latches. From Classic to Scroll to Victorian, you are sure to find the right register for your project from Van Dyke’s great selection of registers from Acorn, Brass Accents, Legacy, Restorers, Reggio, Worth Home, and more. Step 1 – If this is a replacement, remove the screws and lift out the old register. Some registers do not have screws and lift straight up. If this is new construction, got to step 2. 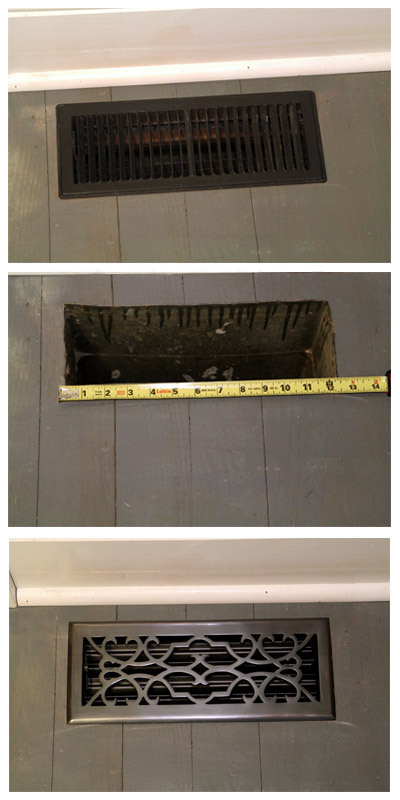 Step 2 – Measure the opening in your floor, wall or ceiling vent opening. The width and length of your opening is the inside measurement of the grille. Step 3 – Measure Twice. Please measure again to confirm the measurements are correct. Step 4 – Select the size, style of register, material (wood, metal, etc. 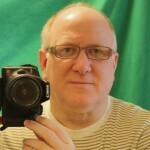 ), and finish you prefer for your project. Step 5 – Drop the new register into the opening and screw into place if the unit uses screws. Available finish options include Antique Brass, Aged Iron, Black Powder Coat, Bronze, Pewter, Polished Brass, Satin Nickel, Oil Rubbed Bronze, and Weathered Bronze. Registers and grilles are made of brass, steel, iron, or wood.